How Do You Know When To Stop ‘Pushing Through The Pain’ Of An Injury? For those who enjoy an active lifestyle, an injury can be devastating to your training regime. Besides the obvious pain or discomfort, an injury can stop you from taking part in the activities you enjoy most, and can set you back with your fitness goals. No one likes sitting on the sidelines and missing out. However, if you feel like you’re seriously losing progress or backsliding on your diet and exercise program, there may be a way to push through your injury and continue to improve your performance. How do you know when it’s safe to continue, and when you should give it a rest? All injuries are different, so it’s essential to consult a professional before making any decisions on your training regime and treating your injury. Here are some general some tips for how to recognize when you’re able to keep going, as well as how to recover safely. You’ve heard the saying, “no pain, no gain,” right? It’s a much-appropriated maxim meant to illustrate that hard work reaps rewards. In the fitness world, it means you won’t see results if you don’t push yourself. 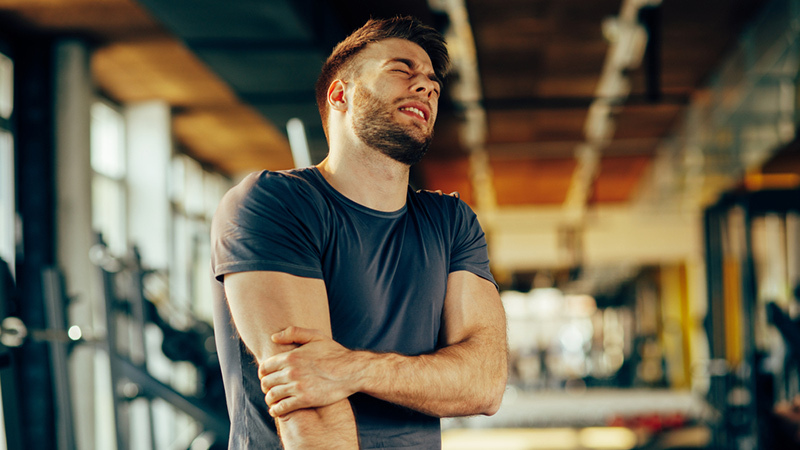 However, while some pain can be good (like slightly sore muscles the day after a grueling workout), there’s a right way and a wrong way to feel and push through pain. 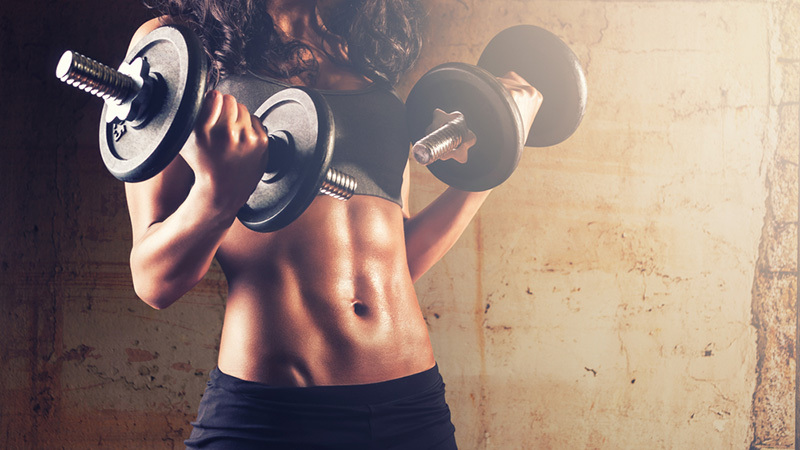 When lifting weights, you want to feel the pain of muscle fatigue when they’re pushed to their limits. But fatigue has its own distinct feel, which is completely different from the sensation of a debilitating, sharp pain. If you feel any sharp pain sensation, cease your exercise immediately. Tearing, popping, or any other unusual and acute pains should be taken seriously. Finding the right set of gentle exercises can be the best way to push past a mild injury. You will often find that while one movement is uncomfortable, another motion completely avoids the problem. If you feel pain when pushing, but not pulling, it makes sense to simple avoid that exercise until the pain has subsided. Furthermore, injuries that hamper arm exercises (like a shoulder injury) won’t affect your leg workout, so find ways to stay active without aggravating your injury and don’t skip out on your other routines. Physical therapists use targeted exercises to help patients overcome injuries. If you’re unsure about which exercises are safe to perform, or worried that you’re doing something dangerous, find a professional physical therapist to help guide your recovery. You’ll be able to rebuild strength and stability, without worrying about doing too much or too little, since a professional can assess your specific injury and lifestyle, and know exactly what to do (and what not to do) for optimal recovery. Sometimes, there’s just no other way around it: You need to rest. Your health should always be a priority over everything else — including your training regimen or the big game — and a serious injury means it’s time to take a break and reevaluate. Aggravating or intensifying an injury is always a no no. Take the requisite time to rest up and heal; your body will thank you for it. If you’re not sure, ask your physical therapist about recovery time and how to safely ease back into your regular routine. 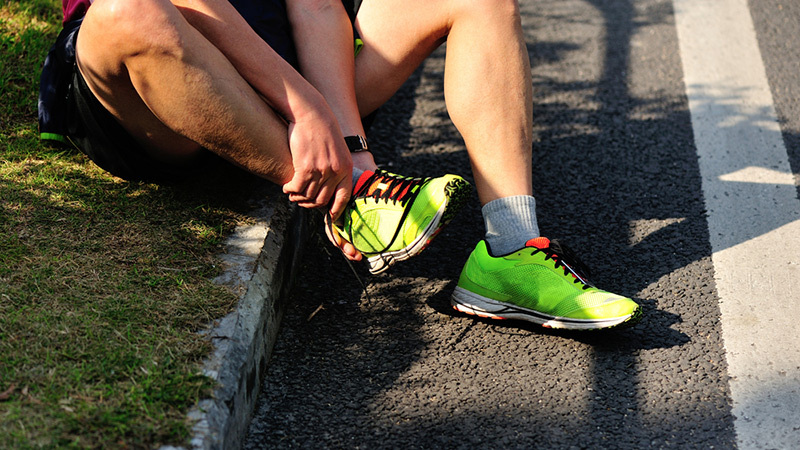 Injury prevention can be just as important as recovery time, and once you’ve healed up, it’s vital to engage your muscles, joints and tendons in a way that will help them stay healthy for the long haul. Physical therapists can often help you develop a program with the aim of preventing re-injury by targeting the adjoining muscle groups. Your body parts work together to perform complex movements; you need to strengthen it as a whole in order to return to ideal working order. Do not neglect this phase of re-strengthening, as it can make the world of difference in preventing re-injury. When you’re injured, it can often feel like you’ll never be the same again, but don’t despair. Pain is only temporary, but your drive to overcome obstacles is limitless. Take these tips to heart and you will be back to your usual routine in no time. Consult to your physical therapist, take it slow, listen to your body, and make it your goal to not only recover from your injury, but bounce back even stronger than before.